Just 15 minutes from downtown Sacramento, 20 minutes from Davis, the Old Sugar Mill is a historic site undergoing a stunning transformation into one of the top wine-tasting venues in the country. 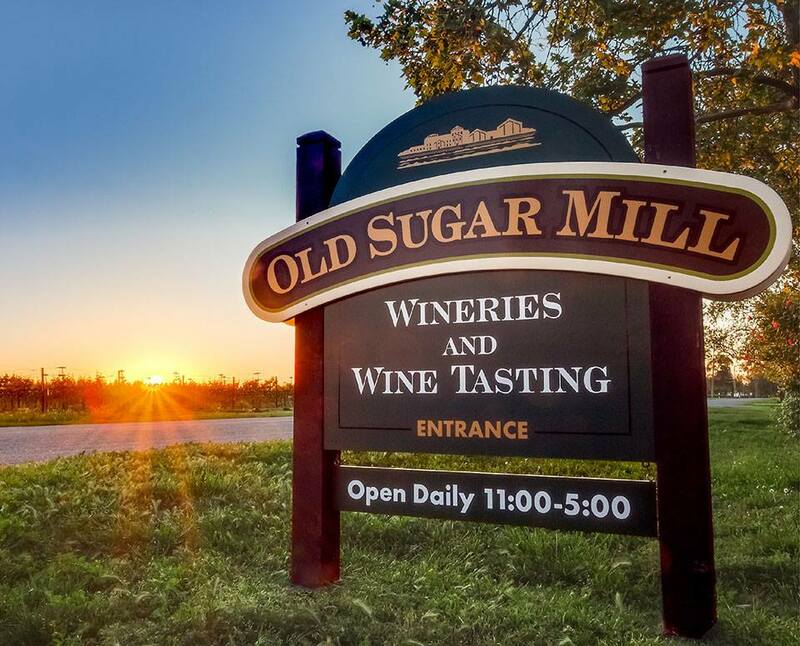 Eleven wineries now call the Old Sugar Mill home, and more are planned for coming years. Music, food, and seasonal events dot the calendar. Set at the edge of a quiet Delta town, it’s also a fantastic venue for meetings and a favorite locale for weddings and other special occasions. The venue is framed by historical old world brick walls, beautiful wine barrels, rustic windows, and artistry and craftsmanship with rich character. One of the notable features of the Mill is the soaring atrium, which serves as the concourse or lobby for the wineries and is the setting for many events. Lovely views appear in the glass walls on either end of this lobby, invoking a quieter time in the world. The Old Sugar Mill was built in the 1930s and served as a sugar beet processing facility for decades. In the year 2000, renovations began to convert the plant into a multi-tasting-room venue and wine production facility. It opened to the public in 2005. Today, the wineries are: Clarksburg Wine Company, Carvalho Family Winery, Draconis, Due Vigne de Famiglia, Elevation Ten, Heringer Estates, Merlo Family Vineyards, Perry Creek, Rendez-vous Winery, Three Wine Company, and Todd Taylor. The tasting rooms reflect the unique style and character of each producer and each employs its own knowledgeable staff. Most of the wineries sources their grapes from Clarksburg or Yolo County vineyards, but others feature vintages from Napa, Sonoma, and the foothills of the Gold Country. Numerous events throughout the year include a Port and Chocolate Weekend (around Valentine’s Day), Spring Fling, Cinco de Mayo, Bread, Cheese & Wine, and many others. Concerts are scheduled in the summertime, taking advantage of the extensive patio and lawn areas around the buildings. Get to events or tastings early ~ Recently the Wine, Cheese & Bread Faire, which included numerous additional food vendors plus live music and sales, attracted more than 4,000 guests over a two-day weekend. Getting there early allows for plenty of time to take in everything at your leisure. You can plan ahead for events by checking the website: www.oldsugarmill.com. Bring your camera ~ The drive down takes you through open fields and vineyards and alongside the winding Delta; you may find several interesting spots to get out of your car. The mill complex, with their soaring walls of weathered brick, adjacent lawns, and long-range views, makes a picturesque setting for family portraits or candid shots. It’s more than just wine ~ Many of the wineries also sell olive oils, sauces, jams, cheese, chocolates, clothing, and other goods, even a bit of home decor. You will find lots of gift ideas for family and friends. Wine tasting fees are $5 tops, and the fee is waived with a purchase. Bring seating or a blanket ~ If you like to picnic, here’s your chance! Bring chairs or a blanket and stretch out on the back lawn; you can bring your own food or shop for snacks along with your wine in the tasting rooms. As an alternative, you can venture into town to visit Husick’s Country Store (36510 Riverview Drive; www.husicks.com) for a great selection of sandwiches, paninis, and sides. Husick’s also sells selected local wine and a variety of condiments and gift baskets. 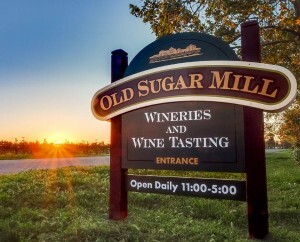 Other wineries in the Clarksburg area include Bogle Vineyards, Miner’s Leap, River Grove, Twisted Rivers, and Wilson Vineyards; only Bogle and Miner’s Leap have regular tasting room hours. The Old Sugar Mill is open 361 days a year from 11am to 5pm. It is located at 35265 Willow Avenue, in Clarksburg. For more information, call (916) 744-1616 or visit the Old Sugar Mill website.